In the month of January, I hosted my very first Fear NOT workshop for women who wanted to push past their hesitations and move into their destinies. It was a complete eye-opener for me as I had to face my own fears and press on just so that I could practice what I would be preaching. In coaching the women in the workshop, I discovered that they were apprehensive about their own gifts and purposes, but they were more than qualified to launch out. They had degrees in their chosen fields, had been working in these fields for 10-plus years, studied and earned certifications, had been practicing their talents their entire lives. But why when it came time to actually DO what their bigger picture and inner selves were nudging them to do, they got cold feet and stage fright? Friend, can I submit to you that fear is nothing more than a liar and a thief? It is a spirit, which means it is a being, that whispers subtleties in your ear that you choose to obey. Most of what we fear isn’t even real, and the things that actually do happen to realize our fear are likely born out of our own meditations. Fear is what is telling you that you aren’t good enough, don’t know enough and nobody will listen to you or appreciate what you have to offer. Fear is what told my dear friends in the workshop that they didn’t know how to write, compose music, coach people about their health, or encourage teen girls when they have all been preparing for this their whole lives. The truth of the matter is, fear is robbing you of time. 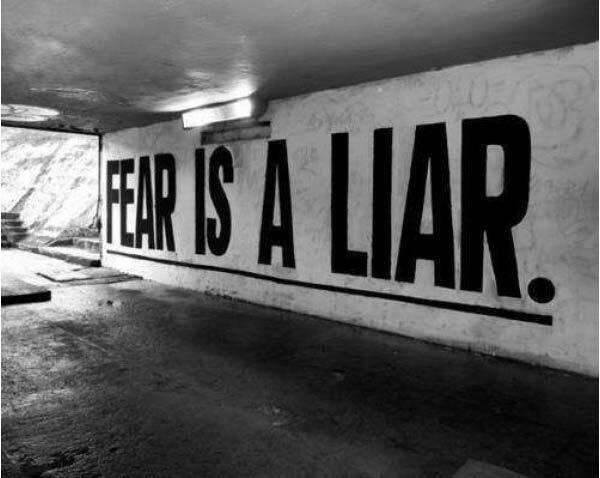 Fear is a thief that manifests itself as procrastination and excuses. You keep telling yourself you can’t, you don’t know or I’ll do it later when the truth is, you can, you do know, and you have no intention of doing it later. The more you wait, procrastinate, and make excuses, the more time the SPIRIT OF FEAR is stealing from you. It is stealing opportunities, wealth and more of your confidence, putting you on a perpetual cycle of doing nothing. Time is the only resource you cannot get back. Fear is slowly sifting it away from you. It is your season to MOVE. Each of you are qualified – God qualified you. Each of you is prepared and where you may feel you aren’t, His strength is made perfect in your weakness. Either you are going to believe God or not. Either you are going to move or you are going to remain paralyzed. Faith or fear? Which will you choose? Courage is not the absence of fear, but it is the strength to move beyond it. I hope that you would take courage this week. If you are interested in joining the Fear NOT workshop, I would love to have you. Just follow this link to sign up! “Time is the only resource you can’t get back”… A true eye opener. Thanks Chanelle.